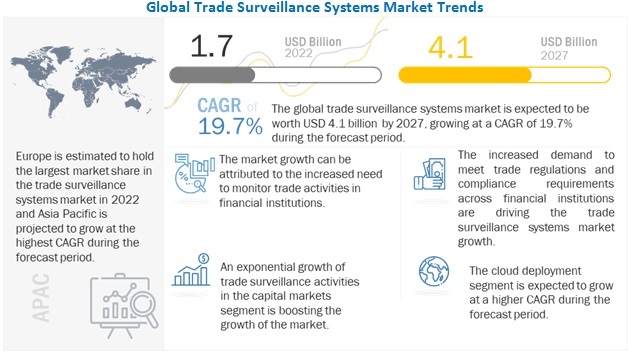 [111 Pages Report] MarketsandMarkets forecasts the global trade surveillance systems market to grow from USD 511.5 Million in 2016 to 1,449.6 Million by 2022, at a Compound Annual Growth Rate (CAGR) of 19.3% during the forecast period. The forecast period has been considered from 2017 to 2022, while 2016 is considered as the base year for estimating the market size. The main objective of this report is to define, describe, and forecast the trade surveillance systems market by segments – component, deployment, organization size, and region. The report provides detailed information regarding the major factors (drivers, restraints, opportunities, and industry-specific challenges) influencing the market growth. The report forecasts the market size with respect to 5 main regions: North America, Europe, Asia Pacific (APAC), the Middle East and Africa (MEA), and Latin America. The report profiles key players and comprehensively analyzes their core competencies. This report also tracks and analyzes competitive developments, such as mergers and acquisitions, new product developments, and Research and Development (R&D) activities in the market. The research methodology used to estimate and forecast the trade surveillance systems market begins with the collection and analysis of data on key vendors’ product offerings and business strategies from secondary sources, such as IT service providers, technology providers, press releases, and investor presentations of companies; and white papers, technology journals, certified publications, and articles from recognized authors, directories, and databases. Vendor offerings have also been taken into consideration to determine the market segmentation. The bottom-up procedure was employed to arrive at the total market size of the global market. After arriving at the overall market size, the total market was split into several segments and subsegments, which were then verified through primary research by conducting extensive interviews with key people, such as Chief Executive Officers (CEOs), Vice Presidents (VPs), directors, and executives. 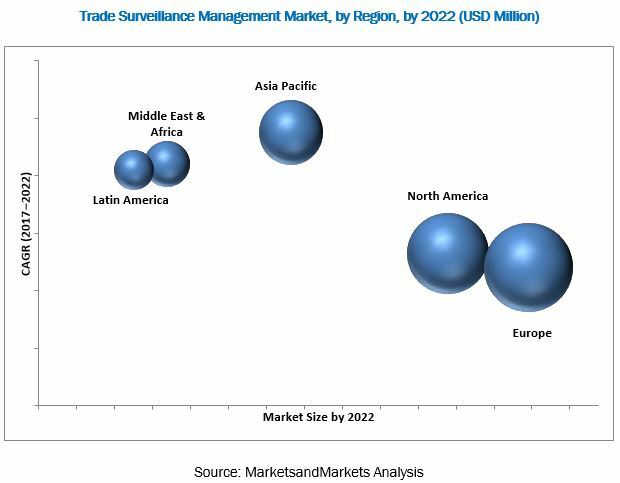 The trade surveillance systems market is expected to grow from USD 600.2 Million in 2017 to USD 1,449.6 Million by 2022, at a CAGR of 19.3% during the forecast period, owing to the increasing need for surveillance to control market manipulation and abuse. The rising pressure on financial markets to adhere to the regulations and compliances is also a major driving factor for the trade surveillance systems market. However, the complexity of analyzing multiple parameters and monitoring real-time events for fraud detection is a major restraining for the adoption of trade surveillance systems. The solutions component is estimated to dominate the trade surveillance systems market in 2017. Trade surveillance solutions offer organizations several advantages, including the optimization of surveillance data, enhancement of compliance management, and streamlining of case management. The demand for services from enterprises is expected to increase, as the adoption of solutions by financial institutions is growing. Moreover, to automate, enhance, and manage the surveillance process for improved agility and efficiency, enterprises are implementing trade surveillance systems solutions. The on-premises deployment model is expected to account for a major share of the trade surveillance systems market by deployment type. On-premises solutions are delivered with a one-time licensing fee, along with a service agreement. They have been deployed on a large scale in financial institutions over the years, as trade surveillance vendors offer customized on-premises solutions to cope up with the available IT infrastructure. It contributes to the dominance of on-premises solutions in the market. Europe is expected to hold the largest market share and dominate the Trade Surveillance Systems Market from 2017 to 2022. This is due to the high adoption of cloud-based trade surveillance systems by enterprises of all sizes and the regulations imposed by the governments in the region. Meanwhile the APAC region is projected to provide high growth opportunities for vendors of trade surveillance systems in the coming years. This can be majorly attributed to the rising investment by financial institutions to meet the compliance needs in the region. Analyzing multiple parameters and monitoring real-time events for fraud detection is complex. Automation may increase risks posed to markets by illegal or otherwise inappropriate conducts, as market participants can trade various products and enormous volumes in a fraction of second. Analyzing High-Frequency Trading (HFT) activities while huge volumes of data are being generated in real time is still a complex factor that needs to be addressed for better trading marketplace and detecting the market-hampering fraud activities. Major trade surveillance system providers include NICE Systems (Israel), FIS (US), Software AG (Germany), Nasdaq (US), Cinnober (Sweden), Aquis Technology (UK), SIA S.p.A (Italy), IPC (US), b-next (Germany), ACA Compliance Group (US), OneMarketData (US), and Scila (Sweden). These players have adopted various growth strategies, such as new service launches, upgradations, and partnerships with technology companies to cater to the dynamic and specific needs of their clients across the globe.